Don’t be alarmed, but there is a black hole in your bathtub. When you drain the tub, water converges on the plughole and speeds up, eventually flowing too fast for surface waves to propagate outwards. Those waves get swept down the drain like hapless astronauts falling into a black hole (see video at end of post). For even more fun, there’s a time-reversed black hole, known as a white hole, in your sink. When a stream of water from your faucet strikes the sink and splays out, it initially moves too fast for ripples to propagate inwards. As it diverges, it slows. Within an inch or two, waves become able to propagate in every direction—a transition that is clearly visible as a discontinuity, or “hydraulic jump,” marking the perimeter of the white hole (see photo below). These aren’t just loose metaphors. An accelerating or decelerating fluid flow is mathematically the same as a black or white hole, as Bill Unruh of the University of British Columbia first noted in 1981. In recent years, physicists have exploited the analogy to explore gravitational phenomena. A pioneer of this emerging field is Silke Weinfurtner of the University of Nottingham. I interviewed her in October at the Emergent Quantum Mechanics conference in Vienna. In this video, she describes two experiments. First, she talks about her current project to model a rotating black hole as a vortex of draining water. 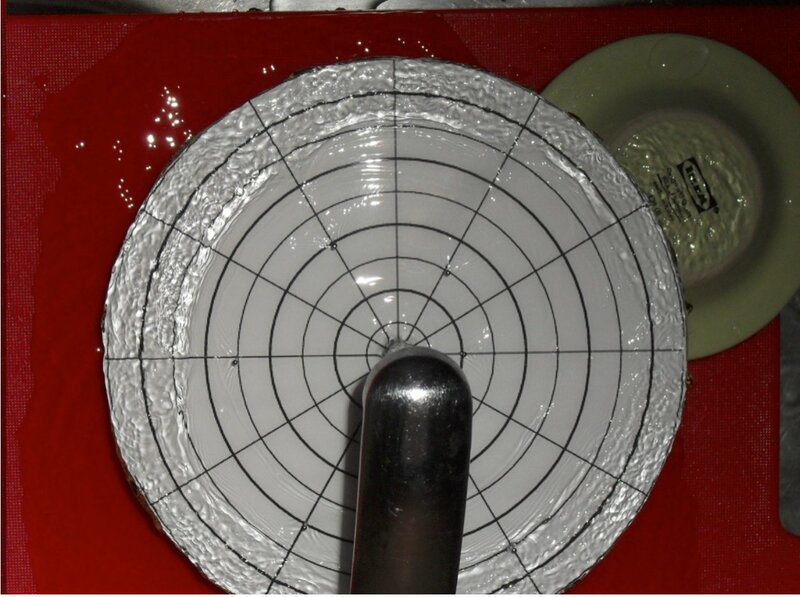 She tracks surface waves that get close enough to the hole to be swept up in the vortical motion, but not so close that they get sucked down the drain. Such waves should be able to escape back out with more energy than they originally had—a process known as superradiant scattering. Second, Weinfurtner recounts her earlier work with Unruh to model a white hole in a long trough of flowing water. 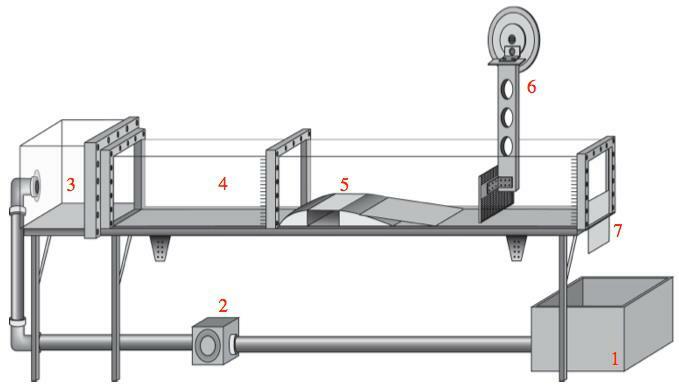 In the diagram at right, the water flows from left to right. A motor at 6 creates surface waves with a wavelength of above 60 meters. Those moving downstream are swept over the edge at 7, while upstream ones travel toward the underwater obstacle at 5. In such a channel, ripples propagate at a speed that is proportional to square root of the depth, so they slow down when they start passing over the obstacle and are eventually unable to continue traveling upstream. The obstacle thereby creates an event horizon, a boundary across which waves can go one way but not the other. In this case, it is a white-hole horizon, into which nothing can enter. If you mentally run the whole thing in reverse, you have a black-hole horizon, from which nothing can escape. The analogy goes further. The fluid horizon also creates a version of the Hawking effect, the quantum instability whereby a black hole sheds particles. As incoming waves bunch up near the horizon, they cease to be waves in the usual sense. The water trembles in a confused mess, setting new waves into motion with a much shorter wavelength, about 20 centimeters. They come out as pairs, one of which is absorbed while the other propagates away from the horizon. (Were this a black- rather than white-hole horizon, the incoming waves would have a short wavelength and outgoing waves a long one.) That’s just like the Hawking effect. The waves even have the thermal spectrum that Stephen Hawking predicted. The main difference is that in real black holes they arise spontaneously from fluctuations at the quantum level, rather than incoming waves generated by the apparatus. The observed effect agrees with theory despite the approximations in the setup, indicating that the analysis is robust. The analogy between curved spacetime and fluid flow is so tight that some theorists have argued that spacetime is literally a sort of fluid, perhaps constructed out of some sort of “molecules” and even capable of undergoing a change of state, the theme of Chapter 6 of my book. Something to ponder the next time you take a bath. Update (20 September 2017): I visited Weinfurtner’s lab last week and her student Sam Patrick demonstrated how the drain-hole vortex in their experimental tank resembles a black hole. Using tweezers he disturbed the water surface at several locations. Close to the drain, the vortex flow was so fast that the disturbance couldn’t propagate against it. Instead it was swept into a distinctive triangle shape, analogous to the tilted spacetime light cones that define the geometry of a black hole. Earlier this year Weinfurtner and her team succeeded in measuring superradiant scattering. As a quick demonstration, Patrick plunged a glass jar into the water to send out a series of ripples. 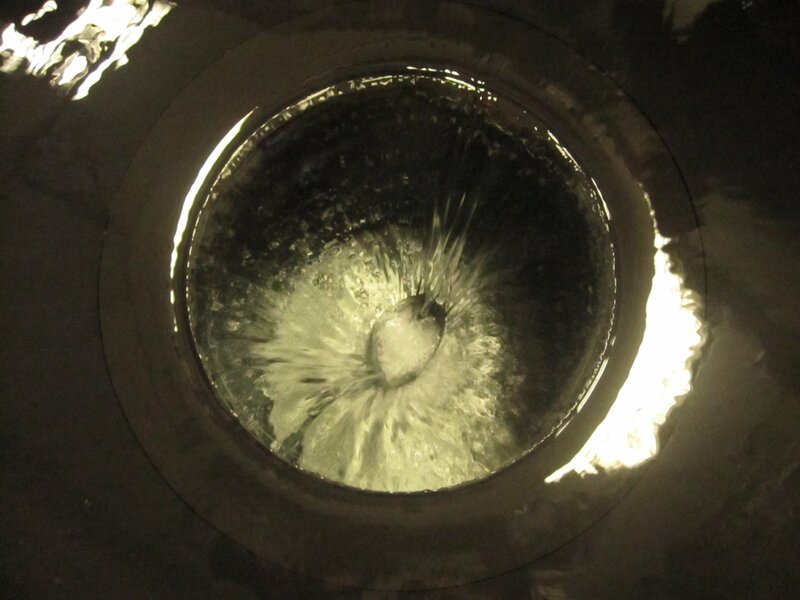 As they approached the drain hole, the vortex flow flung them around. The result was a spiral pattern, which rotated the opposite direction as the vortex and extracted rotational energy from it.